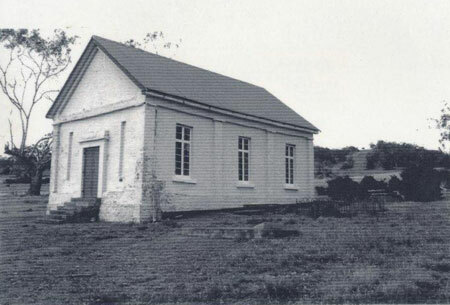 Built in 1840, this Chapel located at Deddington, Tasmania is on land gifted from Robert Pitcairn. Brothers Robert and Thomas Pitcairn arrived in Hobart, Van Diemen's Land on the ship "Portland" on 10th September 1824 holding letters of Recommendation. Thomas received a "Grant of Land" of 640 acres at Mills Plains, now Deddington, where he took up occupancy in 1826. Robert received a "Grant of Land" of 800 acres at Grassy Hut, Bothwell and he took up occupancy of the land, also in late 1824. In late November/December of that year he apparently arranged for an exchange of this Bothwell Land Grant for land the River Nile, adjacent to the land granted to his brother. Robert subsequently received another Grant of Land of 800 acres in 1829 adjoining and it is from this subsequent Grant that he gave an "Allotment upon which was erected the Chapel. It is understood that this "Gift of Land for this Chapel purpose was made following a request/suggestion from Rev. Robert Russell of the Presbyterian Church of Evandale. The Chapel was built by Public Subscription on this "Gifted Land" with Land Ownership being transferred to "The Residents of Deddington", in 1849. From 1865 the Chapel began use as the Local School and continued for this purpose until 1885. It was again used for the same purpose in 1912. Major restoration work on the building was undertaken by the National Trust of Tasmania in the 1960's with assistance from local residents and further maintenance was completed by the Chapel Trustees in 1999.Ongoing maintenance is always needed and this has included Grave restoration, fencing, landscaping and Chapel signage. The graves present include Colonial Artist John Glover and his wife Sarah (nee Young) and their sons Henry & John Richardson Glover.